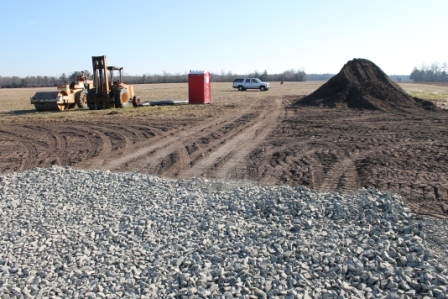 GREENWOOD, Del.- Delaware Electric Cooperative has broken ground on a new 20 acre solar energy farm, which will provide clean, reliable energy to members of Delaware’s only member-owned electric cooperative. The facility is being built on East Trap Pond Road west of Georgetown. The solar energy farm is expected to be completed and in operation in May of 2013 and will feature 16,000 solar panels capable of producing four megawatts of power, enough to supply energy to 500 homes. The project has created 40 temporary jobs for Delaware solar contractors and the solar panels being installed at the facility were manufactured in the First State. “The solar panels were manufactured by Motech Americas in Newark, Delaware. We are excited to build a solar energy farm that will reduce carbon emissions and provide members with a sustainable source of power for years to come. The fact that the Cooperative has been able to provide a boost to the state’s economy makes this project even more exciting,” said Bill Andrew, President and CEO of Delaware Electric Cooperative. Andrew said the project will cost approximately $14 million and is not expected to have an immediate impact on member’s rates. DEC will own the solar facility and energy produced by the panels will flow directly to member’s homes. The farm could eventually be expanded to 40 acres with the ability to produce seven megawatts of power. This project will also help Delaware Electric Cooperative comply with state mandates, which require utilities to invest in renewable energy projects. Delaware Electric Cooperative is a member-owned electric utility serving 84,000 member-owners in Kent and Sussex County, Delaware. For more information visit us on the web at www.delaware.coop or www.beatthepeak.coop or follow us on Twitter and Facebook.